Some life-forms engage in symbiotic partnerships with other organisms. 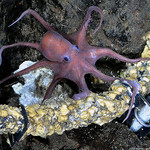 An octopus may provide shelter for toxic bacteria, which then give the octopus yet another tool in its arsenal—the ability, found in certain species, to inflict a deadly bite. This skill, too, can translate to the man-made world. Symbiosis is at the heart of a remarkable partnership between Israeli, Palestinian, and Jordanian health practitioners who are sharing technology, databases, medicines, and knowledge to identify and reduce the threat of infectious diseases regardless of where they appear. These symbioses work not because they are perfect, all-encompassing solutions but because they solve immediate problems. The doctors in this coalition didn’t set out to create peace in the Middle East, but if peace does break out there, it will undoubtedly owe some credit to symbiotic relationships like this one. [T]he facilitators of this Middle Eastern infectious-disease consortium have replicated their success in the mutually hostile southeast Asian countries bordering the Mekong River and are now bringing the model to southern Africa. 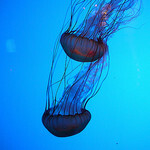 [M]y new company is called Jellyfish Labs—very intentionally, because jellyfish can’t choose their own course. They can’t locomote. They are carried by the current. And they have to trust the current will take them where they need to be and keep them alive. I went off the track with Big Idea when I started making 20-year plans. I was like, “Okay, God, this is what I’m going to do for You in the next 20 years. Now, all You need to do is just bless it.” When we do this, we don’t have to listen anymore, because we’ve already figured out what we’re going to do. God is in some sort of subservient role where He gets to sit in the back seat and hand out the credit card when we need resources. But for a jellyfish to make a 20-year plan—it’s humorous. It’s lunatic. I had viewed myself as a big macho barracuda in the ocean of life. In reality, I was a jellyfish—basically a spineless bag of goo that has no form. Expats, repats, TCKs, ATCKs, missionaries, ex-missionaries, and others who face life-changing transitions can find it hard to make, and keep, long-term plans. What does the future hold? Will my transitions define my life? Where am I headed? Who have I become? There is a time for making big plans and for having big ideas, but thanks to Phil Vischer for reminding us that even though the jellyfish doesn’t control the currents, it still gets where it needs to go. You are currently reading Octopi, Jellyfish, Cross-Cultural Partnerships, and Making Plans at Clearing Customs.